San Diego, CA – June 5, 2013 – Troxel LLC, the worldwide leader in ASTM/SEI-certified equestrian helmets, is delighted to announce their continued support and participation in the 3rd annual Riders4Helmets International Helmet Awareness Day, to be held on Saturday, June 22nd, 2013. “Troxel is proud to once again partner with Riders4Helmets in its efforts to increase awareness about helmet safety and education for International Helmet Awareness Day”, said Shay Timms, CEO of Troxel. 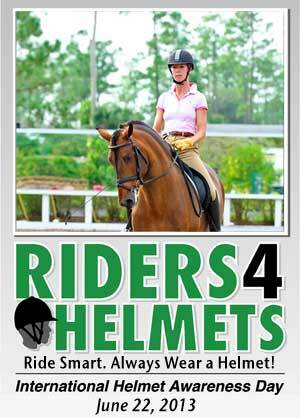 International Helmet Awareness Day offers equestrians the opportunity to purchase a helmet at a special one-time discounted rate and more importantly, is an opportunity for riders to be educated about helmet safety. Equestrians will be able to ask a variety of experts real-time questions during the event through live streaming “Get Educated” webinars via Riders4Helmets.com. The confirmed line-up of participants will be announced at Riders4Helmets.com prior to June 22nd. Troxel’s product ambassador, 14 year-old barrel racing champion Megan Sparks, exclusively shared her experiences of wearing a helmet in a cowboy hat world: “Cowboy hats have always been the tradition and there are still so many people wearing hats nowadays. So everyone gets the impression that if you’re wearing a helmet, you are a bad rider, and fall off a lot. This is not true. Those people are uneducated as to why you should wear a helmet. I don’t see this changing for older generations, but for the younger generation, yes,” said Megan Sparks. Read more from Megan’s interview. For more information on International Helmet Awareness Day please visit www.riders4helmets.com/ihad.